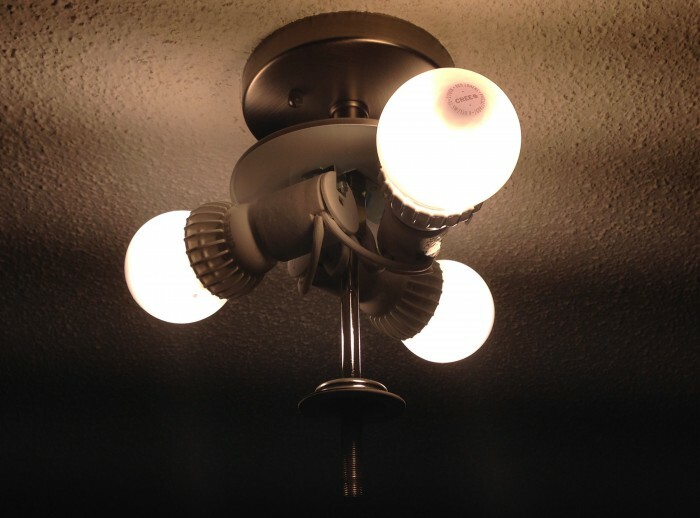 My quest for the "perfect" 60 watt light bulb replacement goes back a few years. 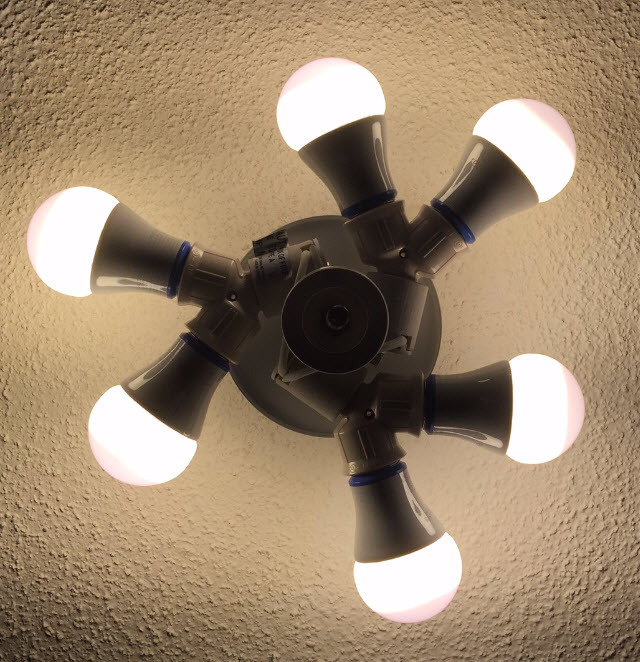 Like many other tech bloggers before me, I find myself obsessed with finding cool-running quality lighting, having been disappointed by all CFL (Compact Fluorescent Light) bulbs. I just keep hoping that there's a "just right" LED bulb out there, but for 2013, it appears there just isn't. All the LED designs are a compromise. After carefully researching suitable candidates and pouring over spec sheets, I've tried 8 different bulbs these last 3 years, returning most of them quickly. 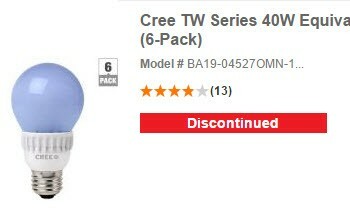 And so far, I'm confident the Cree TW Series LED is currently the best reasonably priced (sub-$20) bulb out there. Among the many models I've carefully shopped for, the Philips L-Prize Award Winning bulb came pretty close, but its yellow color (when off) appearance, and high price of $45 USD, make them impractical for many applications, visually and financially. The Lighting Science Definity A19 was pretty good too, but for $21.95 and a CRI of only 85, the new Cree is better. See also the video demonstrations below. These TW Series LEDs have a very high CRI (Color Rendering Index) of 93. The warm, natural color rendering makes for a very high family acceptance factor. If your intended use is around clothes or food, these would make a very good choice. Flicking a light switch, or even a dimmer from off to the highest setting, is immediate. None of that CFL lag or warm-up time. That means they're a safe choice for stairwells and closets. Currently, only available in the United States, and only at the Home Depot online store. You have to order a $109.82 6 pack, which brings the per bulb price down to $18.30. So made sense for me, in 2 bedrooms that had new ceiling fixtures, the semi-enclosed Progress Lighting Renovations Collection 3-Light Antique Nickel. If you need a dimmer, they are dimmer compatible. But when you slide a dimmer slowly upward, it takes quite a bit of slide before they pop on. Immediately after that, you can choose any dimmer level, and go way down low if you'd like (seen in video below). If used in a dirty environment, I would guess that the somewhat sticky rubbery covering over the glass enclosure will get pretty grimy over time, potentially reducing light output. At room temperature, once this bulb has been warmed up for a few minutes, the passive cooling fins at the base run pretty hot. Hot enough that you cannot hold a finger to them for more than a second. Why? Well, as the packaging says, this 60 watt equivalent burns 13.5 watts of power. So yes, there are more efficient LEDs out there, but at a huge cost in color quality. Most LED bulbs in the aisles of your home improvement store have a CRI of 80, which is often not found on the label. So while it's easy to find a more efficient and less costly bulb, you'll probably wind up returning them all and going for something more like this Cree. There's a very dim spot at the top of the otherwise evenly illuminated bulb. Not a great look if it's in an exposed fixture, such as over a bathroom sink. Not a big deal if hidden behind frosted glass. When turned off, there's a slight purplish tinge to the bulb that some might find objectionable in an open fixture, pictured below. 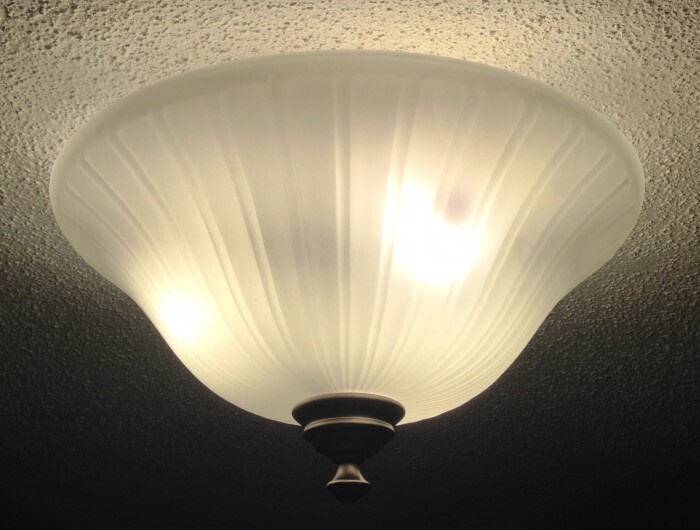 Let's hope Cree learned from their possible issue with adhesive in their cheaper bulb, read Marco Arment's LED story, and my own failed attempt to like that cheaper Cree still found in many home improvement stores, explained here. The summary - currently your best choice, if you really need a 6-pack of LED bulbs now. It still feels like the early days, as far as LED lighting. While affordable and wonderfully high quality LED downlighting has been in my home for years already, it's apparently lot tougher to engineer a true 60 watt replacement. If you're doing a new construction project, or have a stairwell or closet that just can't wait, you'll likely enjoy having these bulbs. But if you can wait, stay tuned to this site, as I'll be keeping a careful eye out for the next generation of affordable 60 watt replacement bulbs. Maybe, just maybe, I'll find a bulb that meets all of my choosy selection criteria in 2014. I realize I'm being picky here, but before I go "all in" on any one bulb to replace all bulbs in my house (except my LED downlights), I had better be darn sure I'm very happy with my selection first. Looking forward, the Switch Infinia looks pretty promising, but the CRI of only 83 still isn't up to what I'd want for interior use, discussed here. Based on Home-On's recommendation here, I'm trying out one of these in the dead of winter (now) on the back porch, to see how it goes. The Switch Infinia has held up to single digit winter and three digit summer temperatures (Fahrenheit) on the back deck just fine. Not sure how it'll hold up to direct sun all morning, with an expectation of yellowing of the plastic due to UV damage. But so far, so good! on the back deck just fine. Not sure how it'll hold up to direct sun all morning, with an expectation of yellowing of the plastic due to UV damage. But so far, so good! The Cree bulbs are holding up fine. Dec 01 2014 by Katie Fehrenbacher at gigaom. I'm not sure there's much else out there for enclosed fixtures that I'd trust. For example, a ceiling fixture with frosted glass and reflector above my shower needs a bulb, so it's getting one of the last 75 watt equivalent Switch Infinia bulbs amzn.to/1Be8ibr, but that's likely my last Switch purchase. 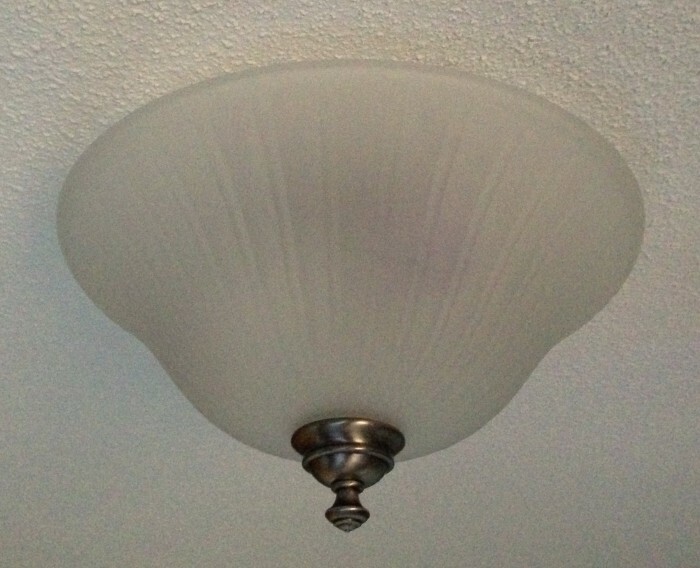 Both of my Switch Infinia bulbs are enclosed, with glass housings that'll capture any possible leakage someday, so I'm not worried about my uses, but I am sad that things didn't work out for Switch, and I felt I owed this update to all TinkerTry readers. I've also contacted Richard Gunther of the Home: On Podcast, who will be doing an update on Switch for his audience soon. The Switch Infinia bulbs are holding up fine, and amazingly, still seem to be orderable on Amazon. The Cree bulbs are holding up fine (mostly, see Feb 13 2016 updates below), and are still available at Amazon, as a 1 pack or 6 pack. They have been discontinued at homedepot.com. GE reveal® LED light bulbs are engineered to filter out dingy yellow tones to illuminate a color enhanced spectrum of light; Provides instant brightness with no delay; Semi-omnidirectional light output of 220 degrees. Shining a light on high-CRI LEDs - These bulbs promise a professional level of color accuracy -- but which one do you want? Another very impressive bulb that Consumer Reports gives its number one rating too is the Feit Electric - 60 Watt Replacement - Omni Directional - LED Dimmable - 3 Pack (144799), with a CRI of 92! I have also been trying out some of these in the home, and I quite like them as well. They are also said to work in enclosed fixtures, so that's a definite plus, which I have not tested yet. I have several glass globe type enclosured hallway fixtures, so those will be my most likely locations to try first. Feit LED 3 Pack, on Amazon. Here's the other "mod" I've did a few months ago. In my office where I want even more lumens, I was getting tired of waiting for affordable 100 watt equivalent LED bulbs that have a good CRI rating. Three 60 watt equivalent LED bulbs weren't enough for the whole room, especially when I'm working on fixing stuff. Socket Splitter 3 pack, on Amazon. I turned off the circuit, screwed these 3 adapters in by temporarily bending the metal brackets slightly as needed. Next, I screwed in the lightweight bulbs all by myself, then turned the circuit back on. Done! It all (barely) fits, and it's still fully dimmable. Not worried about the mild heat, way less hot than any other bulb I had in there, even with 6 of them. See also my FLIR camera's thermal images below. Having another quick look at Amazon today, I don't see any LED ceiling fixtures with bulbs I can easily replace with decent LEDs. Nor are they anywhere near this kind of light output, and don't tell you the CRI. I doubt I'd like any of them, as I've become something of a CRI fiend, finally getting over our common nightmare that was CFL. Someday, I'm hoping for a more opaque glass diffuser to replace the one I have, to hide the bulbs just a bit more. Then again, how often do I look at a fixture, on or off? I'll keep an eye out anyway. Stay tuned! Yes, the tops are dimmer, but this is a far less conspicuous than the Cree TW bulbs. What conclusions to draw are unclear, but my failures could very well be my own fault, so any warranty claim against Cree seems unfair. I hadn't carefully verified whether Insteon makes any claims about LED compatibility. Smarthome does list many other non-Insteon dimmers that explicitly proclaim their CFL/LED compatibility, but I need the Insteon programmable and remote control. My GE Reveal bulbs seem to be just fine after 7 months of daily use with the Insteon 2466DW dimmer. GE's dimmer compatibility sheet is lacking, and doesn't list this Reveal bulb anyway. Finally, even if I were to replace my current Insteon dimmers with an updated offering from Smartlabs, right now they can’t assure me that their latest Insteon dimmer circuitry is fully LED compatible. Other lighting control manufactures, such a Lutron, have official product guides that list compatibility with LED bulbs. It baffles me how Smartlabs supposedly offers modern lighting control products, yet can’t assure compatibility with the current lighting technology. 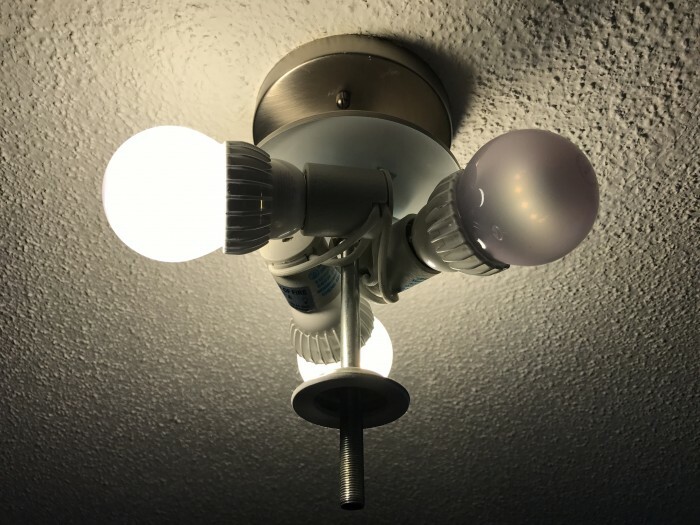 this Creew TW bulb that failed had been in a circuit with an Insteon dimmer, but failed later on in this non-dimmable fixture, with a slight glow remaing. Photo from Jan 27, 2017. I'm disappointed to report back that over the last year, 3 of my Cree TW bulbs have failed, with the most recent failure pictured here. Perhaps I just got a bad batch, or perhaps using them with my particular Insteon dimmer switch did them in, I'll probably never know. Just passing a little data along.